Befitting Eindhoven’s identity as the ‘City of Light’ (Eindhoven is home to the Philips company), ipv Delft also made a lighting design for the Hovenring. One of its main elements is integrated into the circular deck. The space in between counter weight and deck has been fitted with aluminum lamellas, translucent sheeting and tube lighting, which results in a clearly visible ring of light at night. 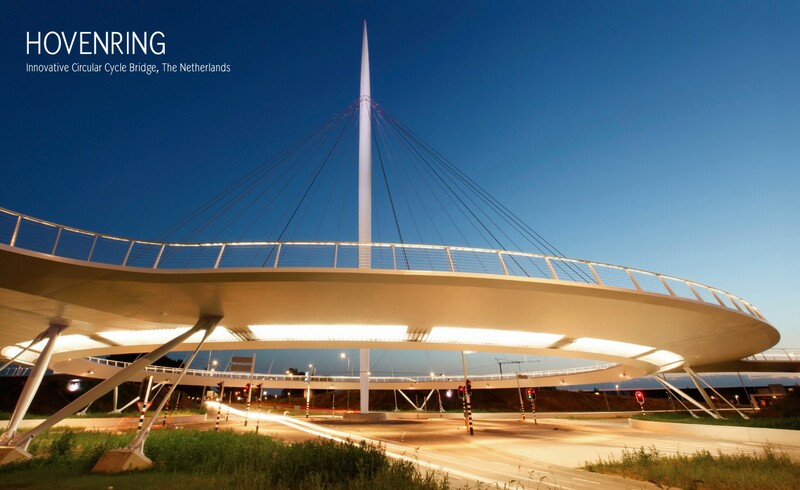 Together with the illuminated pylon, the ring of light ensures the bridge’s spectacular appearance at night. The functional lighting is integrated into the railing, where LED-lighting illuminates the bridge deck and ensures facial recognition of the bridge users at the same time. Lights attached to a cable framework in between pylon and bridge deck and to the inner surface of the circular counterweight illuminate the intersection underneath. Both day and night, the pylon bridge is a true eye-catcher, spectacular in its simplicity.